The flow meters with D (DIN 11851) flowtubes. This category includes electromagnetic flow meters designed especially for food, dairy and beverage industry. Due to the requirements for easy and fast assembly / disassembly during pipe cleaning, these sensors are equipped with the DIN 11851 process connection. The sensor covers are made from a stainless steel SS304 or SS316L, to meet hygienic requirements and requirements to operate in aggressive and humid environments. For operations with particularly aggressive influences (high relative humidity, acidic or alkaline environment, high / low temperatures, …). These sensors can be delivered in a separate design – the transducer (flowmeter display unit) is connected to the sensor with a shielded cable up to 40 m long, then it may be located outside of these areas. Separate sensor design can optionally be made with IP68 protection. These “D” flowtubes are only made with Teflon liner, and with a choice from several sensing electrode materials (316L stainless steel, Hastelloy C, titanium, tantalum,…). These sensors are commonly used to measure the flow of drinking water, wine products, fruit juices, milk, whey, beer and other. It also resists cleaning lyes and acids that are used daily in these industries. 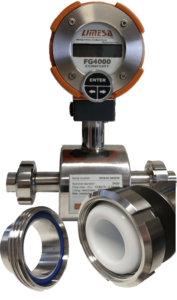 The PTFE liner and the flowmeter itself meet hygienic requirements according to Act No. 258/200 Coll. and Decree of Ministry of Health No. 409/2005 Coll. to products coming into constant contact with drinking and hot water. Normally, these sensors are equipped with SS316L stainless steel electrodes, suitable for measuring common water-based liquids. Especially for the measurement of dairy products the Hastelloy C22 electrodes are recommended. For very aggressive chemicals, Tantal or Titan electrodes are used. The suitability of using a particular electrode material depends on the temperature, chemical composition and concentration of the measured liquid. The basic dimensions and lengths of the sensors are based on ISO standards (see table below). However, customer designs with special construction lengths can also be supplied.